Looking for a Christmas gift that gives back? 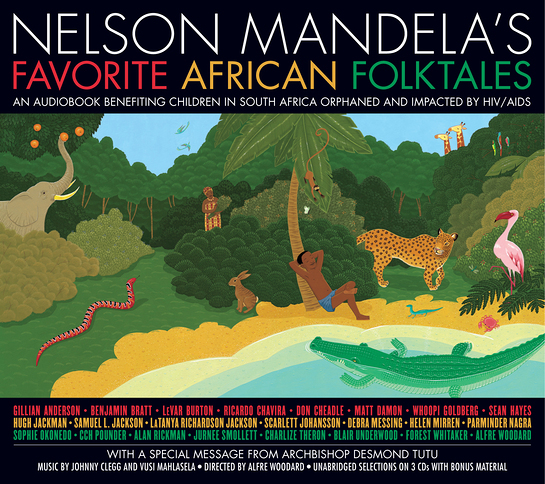 Last year, Look to the Stars brought you a story about Nelson Mandela's audiobook of African folktales read by your favorite stars. We have now learned that the Artists for a New South Africa (ANSA) audiobook has been nominated for a Grammy! 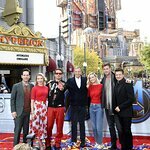 This selection of folktales from across the African continent is performed by a diverse group of acclaimed actors who donated their time and talents to the effort: Gillian Anderson, Benjamin Bratt, LeVar Burton, Ricardo Chavira, Don Cheadle, Matt Damon, Whoopi Goldberg, Sean Hayes, Hugh Jackman, Samuel L. Jackson, LaTanya Richardson Jackson, Scarlett Johansson, Debra Messing, Helen Mirren, Parminder Nagra, Sophie Okonedo, CCH Pounder, Alan Rickman, Jurnee Smollett, Charlize Theron, Blair Underwood, Forest Whitaker and Alfre Woodard. Directed by Alfre Woodard, the audiobook features a special message to the world’s children from Archbishop Desmond Tutu and original music by South African legends Johnny Clegg and Vusi Mahlasela. All of the publisher’s profits benefit the Nelson Mandela Children's Fund and ANSA. Both organizations are working to address the impact of the AIDS pandemic on children in South Africa, which has more people living with HIV/AIDS and more children orphaned by the disease than any other country in the world. The audiobook, which is recommended for children 7 and up and for people of all ages, is published and distributed by Hachette Audio, a division of Hachette Book Group and subsidiary of Hachette Livre, the second largest publisher in the world. The publisher, performers, director, producers, engineers, designers, attorneys, manufacturers, pr team and studios all donated their services. The website www.mandelasfavoritefolktales.com, includes discussion questions, family activities, coloring book pages, background on the performers, audiobook and issues, and other information. The 3-disk audiobook, which includes a PDF with full color illustrations, has already received critical acclaim and awards and has been featured in best of lists including a Grammy Award nomination, National Parenting Publications Gold Award , iTunes’ Best Fiction Audiobooks of 2009, AudioFile’s Best Audiobooks of 2009, Audible.com’s 2009 Top 5 Audiobooks for Kids and Young Adults, a Library Journal’s Fall 2009 Pick, and an Oppenheimer Toy Portfolio 2009 Platinum Award. To find out more about the audiobook and pick up your own copy for Christmas, visit the official website.